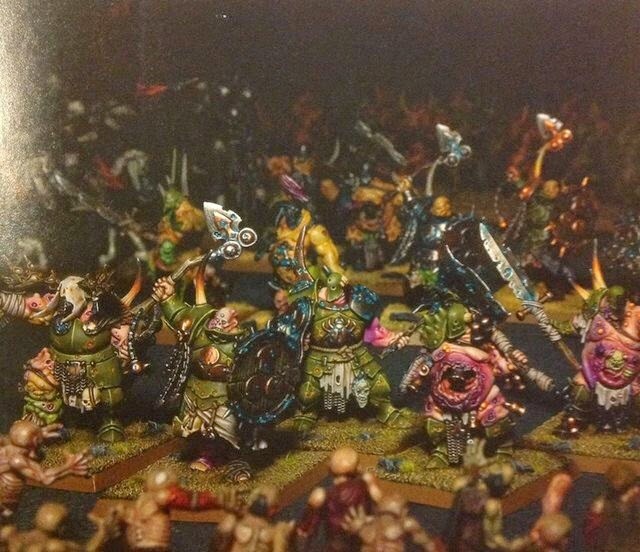 So this Saturday sees the new Nurgle End Times unit "Putrid Blightkings" unveiled in White Dwarf. These are WS6 S4 T5 W3 I5 A3 with the Mark of Nurgle -1 to Hit costed at 40 points per model. They come in units of 5+. However there is one real kicker. Although they are on 40mm bases - normally the preserve of Monstrous Infantry - they are listed as Infantry. In fact the only real advantage they have is if they "infest" a building - ten rather than three can fight. As Infantry they are very very fully priced. As Monstrous Infantry they are in the "Warlock" value aisle. I personally don't think it is a typo. Instead I think that they will be the preserve of fluffers or the basis of conversions. if the intention was for them to be monstrous infantry I would agree they would be masive value. If they are infantry you will not see them used in serious lists for all the reasons you have mentioned above. Why would you pay monstrous infantry point costs and get smacked around by the same things that kill infantry? All I can think off is - best target of Dreaded 13th ever. I think the lord choice SC, if remaining as infantry, could be a good spend of points if you were focusing on a foot based list. LD10, high S attacks, lots of wounds. Would be odd though, as he would somehow receive a LoS though have to deploy on the corner of the unit. interesting, you'd have to think if they were Monstrous Infantry they would be severely undercosted at 3 points less than an Irongut. 3 higher WS, 1 higher T, Mark of Nurgle... and I5. So we are looking at a new base size for infantry on a 40mm so if you so see them it would be a unit of 5..but I'm not sure they fill a role as infantry. I think they will have their uses. What opponents would be getting by being able to stomp them, they lose by needing 5+ to hit. A unit of 5 + FC for 230pts will be useful for countering any inf unit (except WLs), and most cav. They can bunker down with a 3+ save and a shield parry, or bring out S6 GWs. Point for Point Hammerers/Swordmasters/White lions/Executioners are probably the hardest hitting infantry units in the game and these guys knock them out of the park. also with only 5 they are 3 W's away from not being steadfast versus a flank charge from say a DE peg bsb and we never see those..
Yeah good points. I didn't really consider steadfast as it seemed unlikely that they would lose combat much. Bear in mind that DE bsb will be hitting on 5's (re-rolling) then wounding on 3+ (albeit re-rolling 1's too with a lance) with only 3 attacks. 6 might be the go-to number so that they have 6 wounds to remain steadfast just in case. I wish they would have just changed in to a "Ancestor Golem" and given it to Dwarfs instead :) It would have been awesome!